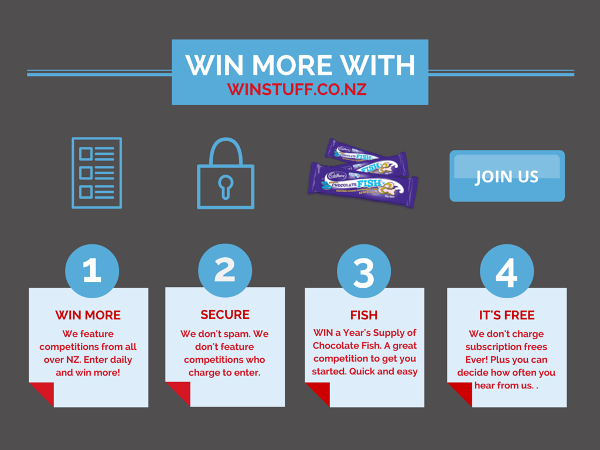 Here we list all the competitions in New Zealand where you can win a holiday. Anything from a local one night getaway to flights and tickets to the States. Competitions are constantly being added and expiring so make sure you check back regularly to see what is available. Everyone wants a holiday, but most of us can’t afford to go to the places we’d really love to visit. That’s why winning a holiday is the perfect solution! Let someone else have all the issues – the stress of booking the transport, the hotel, the worrying about choosing where to go and what the weather will be like – and enter to win a holiday that’s all arranged for you. All you’d have to do is sit down, relax and enjoy your well-earned break. That’s got to be a better start to a holiday than any other possibility imaginable. Plus, if someone else has paid for your trip then that leaves plenty of spending money for dining in style, picking up the best souvenirs and exploring every option available to you while away. No need to miss out on excursions or day trips because of the cost. If you’ve paid nothing for the trip, everything else is a bonus! Picture the scene. No stressing to save up all year to pay for vacation, but instead knowing that your hard earned money is going towards all the fun parts and none of the administration and hassle. Does it get any better than that? Even better, if you win a holiday you can always boast that Lady Luck was on your side and the odds were in your favour. People will think you’re a lucky charm and be asking you your secrets! Imagine the look on your loved one’s faces when you tell them you’re going away on a trip you won in a competition. They’ll never believe it until they’re waving you off at the airport.